April Showers Bring May... Mold. - Basement Waterproofing, Inc. Basement Waterproofing, Inc.
Home → Uncategorized → April Showers Bring May… Mold. As we leave a very wet April and May behind, we begin to turn a corner… we are enter the season of growth and renewal. Looking out, we see greenery and flora dotting our departure from winter. Inside, down in your basement, it may not be quite as pretty a sight. It’s the dawning of mold season. 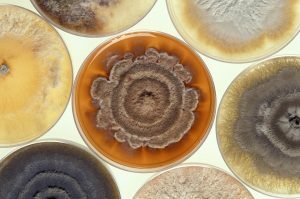 Consequently, the increasing levels of humidity and the darkness of basements are the perfect storm for mold growth for the next six to seven months. Do you listen to your children wheeze or suffer from breathing difficulties? It may not just be from the pollen, but rather the cause is right within the protective structure you call your home. Are you aware that 40 percent of the air your family breathes comes directly from your basement? Are you aware that the natural convection of airflow within your home brings your basement air up into your living space? If you notice a mold problem in your basement, you may think of hiring a mold mitigation company. Yes, they are expensive and yes, they will kill the mold in your basement. They will not, however, teach you how to control your mold situation. Fortunately, you can control mold growth in your home. Mold control is within the grasp of every homeowner; they just need knowledge and pointed in the right direction. Did you know our company offers a complete Basement Spray with every Basement Waterproofing job we install? This spray simply will kill every bit of bacteria and mold up to including the bacteria that causes the H1N1. We also provide the installation of a Humidex system, which will aid in the war against mold in your home and the discomforting effects being inflicted on your family members. Our hope to you, as our customer, is to inform you and teach you how to control your own environment. We want to empower you to control the outcome of your home’s environment without repeatedly spending needless money with mold remediation companies. Check out our Humidex page, and learn how for pennies a day they can keep you on the smart side of a healthy home environment. Our basement gets so damp in the spring! Mold literally grows everywhere. It’s really disgusting, and I feel like I’m always fighting it. I had no idea what to do, because there aren’t any leaks or cracks anywhere – just a lot of condensation, mold and mildew. Yuck! I’m really glad to know a Humidex can help!